You’ve been working hard on your Facebook page for a while now, adding more fans each week and posting interesting photos, links and status updates. And you’ve gotten a significant number of fans who have clicked on that little “like” button at the top of your page. But what do you do with your army of followers? How can you make them work for you? First of all, you need to understand the different ways in which people engage on Facebook. There are varying degrees of engagement, from simply liking your page, to liking some of your content, to commenting and posting on your page. On average, a post gets about a 3 percent rate of interaction on Facebook, meaning that only 3 percent of your audience will like or comment on a post—and that’s only if it’s a good post in the first place. Post boring content and your rate drops significantly. A friend of mine, Robby Slaughter, uses the 90-9-1 rule to describe social media audiences. Ninety percent of your audience are lurkers; they “like” your page, but they will never say anything or interact with you. Nine percent are intermittent contributors—they will say something once in a while. The remaining one percent are your heavy contributors, or superfans. They are constantly interacting with your Facebook page. The key to using your Facebook fans to your advantage when creating an engaging community is to first identify your contributing fans. Who are the 10 percent who like or comment on your posts, post to your wall, share photos and tag you in their own status updates? 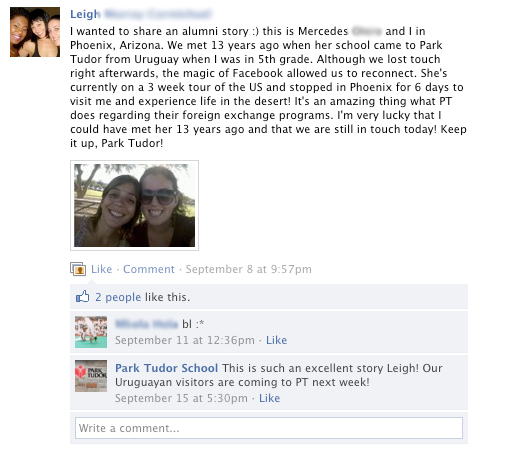 One of Park Tudor’s superfans is a young alumna living 1,700 miles away in Phoenix, Ariz. She not only reads our posts but also comments on them, and she occasionally shares her own stories on our wall, such as this one. Pay attention to your superfans because they can be great storytellers for your institution. Also, look for ways to drive engagement with your fans by turning your intermittent contributors into superfans and your lurkers into contributors. Ask questions through your Facebook posts. Post pictures and videos. Start contests. Share updates from teachers or professors. Talk about traditions. Be conversational. How do your contributors help build your Facebook community? So powerful & simple – the concept of conversing with rather than talking at our audiences. Thank you for these valuable tips.